I had little expectations before travelling to southern Argentina. I had read some of Bruce Chatwin’s famous piece (from which I have stolen the title for this post), but this had failed to prepare me for the sheer beauty, the rugged desolation of this place. The first thing that must be said is it is HUGE. Distances are vast, and a 28 hour bus journey is a standard trip. Then there’s the environment. Think endless empty plains where you won’t see a tree for hours, and the ones you do see are bent so close to the ground I’m not sure they still count as trees. The wind blows constantly and it blows hard, battering and weathering everything. In the west the Andes rise and create glacial lakes, chilly pine forests and snowcapped peaks. In the east the steppe stretches as far as the eye can see, with only the occassional llama or rhea admirably battling the elements. 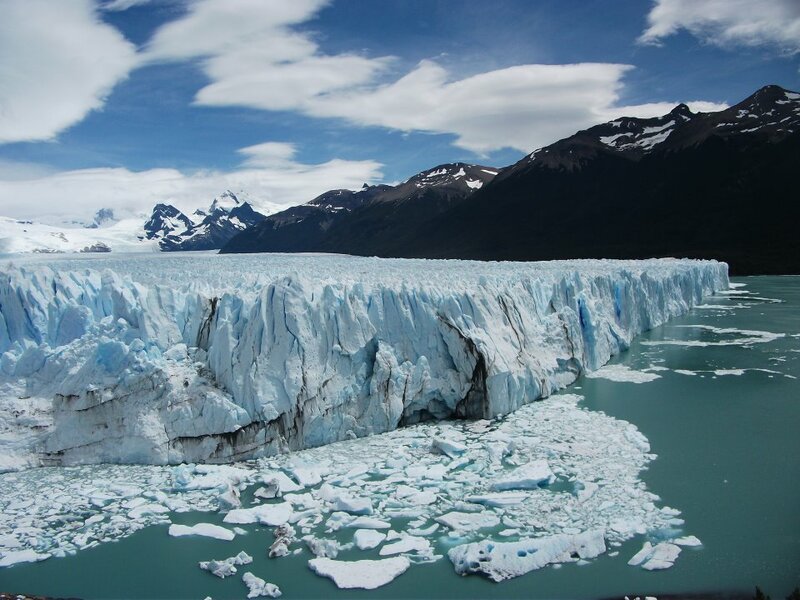 We came here for two things: the Perito Moreno glacier and Torres del Paine’s famous ‘W’ trek. Firstly the glacier. We were informed before visiting that this is one of the only glaciers left in the world that is advancing. But I sure as hell didn’t expect you’d actually be able to SEE it advancing. It is an slightly surreal experience standing in a crowd of people on a wooden walkway watching giant chunks of ice creak and crash from the glacier-face into the frigid lake. The bigger the piece, the louder the sound it makes as it plunges into the water, and the bigger the elation you feel. At first you stand in staggered silence, but after a while you find yourself willing the ice wall to send an even bigger slice to its watery death. There can’t be too many experiences like it. 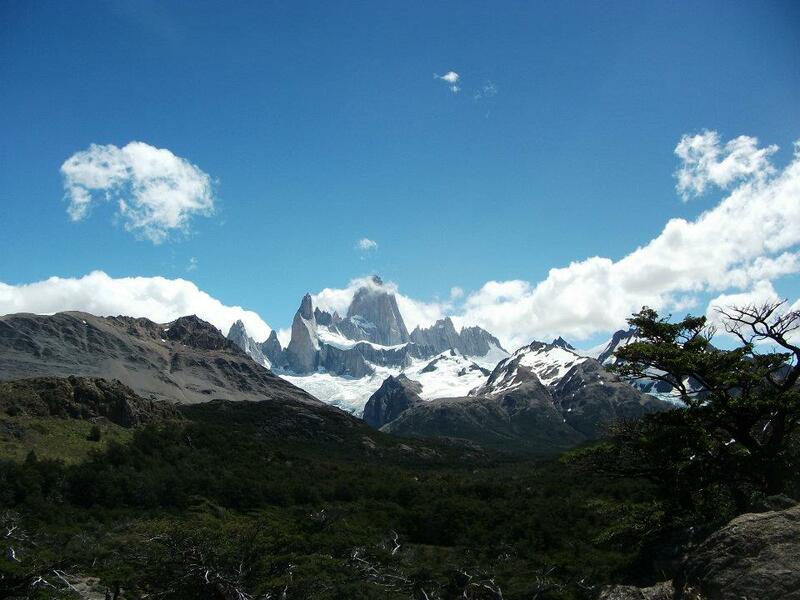 Secondly I would love to have written about how Torres del Paine was a fantastic and life-changing adventure. Unfortunately some douchebag campers set the park on fire and it closed the day we were due to depart. So we went to El Chalten instead, which was spectacular and a worthy replacement. A small town of about 1500 people (it drops to around 500 during winter as locals flee the freeze) set under the shadow of the jagged sharkstooth mountains of Fitz Roy, Poicenot and Torre. It is a wet-dream for outdoorsy types, with knee-cracking hikes and free camping in some truly spectacular landscapes (seeing a giant waterfall cascade directly out of a glacier was one memorable part for me). Sure enough the North Face and Gore-Tex brigade were out in force, eating their cereal bars, drinking out of plastic tubes and waxing lyrical about how outdoorsy they had been the night before. We just kept our heads down, stuck to our ham and cheese sandwiches and enjoyed the wilderness.